Throw out your scoop and save time with our sifting pan. This smartly designed unit features two nesting pans and a sifting screen. Stack the pans with the sifting screen on top and fill with clumping litter. When you lift the sifting screen the litter sifts out into the pan, leaving the clumps that you throw away. Replace the sifting screen in the empty pan, move the litter from the full to the empty pan, restack, and your are finished. Made of durable, easy to clean plastic. High polished finish that is stain resistantFramed pan provides added height, reducing litter spills and holding cat pan liners securely in placeEasy to cleanMade in USAAssorted Colors. Durable plastic with built-in drawstring tie for simple closure. (6-count). Need your item quicker?. We would love to be given the opportunity to work with you to resolve any problem you may have. Pureness giant cat litter pan. For larger cats or multiple cat households with basic litter pan needs. High polished finish that is odor and stain resistant and easy to clean. Entry level pan for larger cats or multiple cat households with basic litter pan needs. This smartly designed unit features two nesting pans and a sifting screen. Stack the pans with the sifting screen on top and fill with clumping litter. Replace the sifting screen in the empty pan, move the litter from the full to the empty pan, restack, and your are finished. The Van Ness Corner Cat Pan is ideal for maximizing room space. High sides help reduce litter scatter that will reduce litter scatters. The Van Ness Corner Cat Pan has a high polished finish, is odor-, stain-resistant and easy to clean. Contain your cat's litter in the Cat Litter Pan with high sides. The kitty litter pan is made by Van Ness and is constructed of durable plastic and contains 20 percent recycled content. It is available in blue or pink. 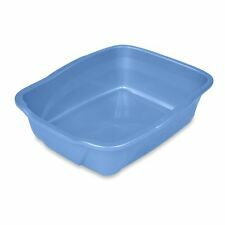 Cat Litter Pan Extra Large High Sided Durable Plastic Pet Animal Box Tray Blue Van Ness High Sided Cat Litter Box, Giant, Color May Vary Contain your cat’s litter in the Giant Cat Litter Pan with high sides. This cat litter pan is made by Van Ness, made of plastic and durable. The giant cat litter tray is 21.2” x 17.5”. Cat Litter Pan. Van Ness CP5 Sifting Cat Pan Easy Clean Litter Box with Frame Assorted Colors High polished finish that is stain resistant Framed pan provides added height, reducing litter spills and holding cat pan liners securely in place Easy to clean Made in USA Assorted Colors Van Ness CP5 Sifting Cat Pan/Litter Box with Frame, Assorted Colors Throw out your scoop and save time with our Van Ness sifting pan. This smartly designed unit features two nesting pans and a sifting screen. Stack the pans with the sifting screen on top and fill with clumping litter. When you lift the sifting screen the litter sifts out into the pan, leaving the clumps that you throw away. Replace the sifting screen in the empty pan, move the litter from the full to the empty pan, restack, and your are finished. Made o. Cat Litter Box Pet House Furniture Kitty Enclosure Cats Indoor Home Covered Pets VAN NESS PLASTIC MOLDING CO Van Ness CP7 Enclosed Cat Pan/Litter Box, Extra Large, colors are assorted Van Ness Covered Cat Litter Box, Extra-Giant, 1 Box. Van Ness Covered Cat Litter Box, Extra-Giant. Enclosed cat litter pan. Van Ness Covered Cat Litter Box, Extra-Giant, 1 Box. Van Ness Products Pureness Covered Cat Litter Box, Extra-Giant, 1 Box Type: Litter Boxes. Van Ness Covered Cat Litter Box, Extra-Giant, 1 Box. Van Ness Products Pureness Covered Cat Litter Box, Extra-Giant, 1 Box: Enclosed cat litter pan Removable door Handle on top for easy lifting and carrying Latches to keep top and bottom together High-polished finish that’s odor and stain resistant and easy to clean Drip shield to help prevent any leaks between the top and bottom cat box 1 cat box that includes both top and bottom. AN. Cat Litter Box Kittens Adult Mature Cats Pet Pan Lightweight Large Van Ness New ltpgtThis Van Ness Cat Litter Pan is the a smart choice for a litter box for your home. It is made of 20 percent recycled content making it a environmentally safe and green Large Cat Litter Pan. This Van Ness Litter Pan is a good size that it can be placed in your bathroom or virtually anywhere you desire.lt/pgt Van Ness Large Cat Litter Box Pets Cats Van Ness Cat Litter BoxesThis Van Ness Cat Litter Pan is the a smart choice for a litter box for your home. It is made of 20 percent recycled content making it a environmentally safe and green Large Cat Litter Pan. This Van Ness Litter Pan is a good size that it can be placed in your bathroom or virtually anywhere you desire. Throw out your scoop and save time with our Van Ness sifting pan. This smartly designed unit features two nesting pans and a sifting screen. Stack the pans with the sifting screen on top and fill with clumping litter. When you lift the sifting screen the litter sifts out into the pan, leaving the clumps that you throw away. Replace the sifting screen in the empty pan, move the litter from the full to the empty pan, restack, and your are finished. Made of durable, easy to clean plastic. Van Ness Products Pureness Covered Cat Litter Box, Extra-Giant, 1 Box Van Ness Covered Cat Litter Box, Extra-Giant, 1 Box. Enclosed cat litter pan. Drip shield to help prevent any leaks between the top and bottom cat box. Contain your cat’s litter in the Giant Cat Litter Pan with high sides. This cat litter pan is made by Van Ness, made of plastic and durable. The giant cat litter tray is 21.2” x 17.5”. Cat Litter Pan. Pets Cats Van Ness Cat Litter BoxesThis large enclosed cat pan controls odors and prevents cat litter spills. Designed from unbreakable high-impact plastic, it easily handles both the weight of your chosen litter and your cats. The enclosed cat pan features a bottom pan and a removable top. Four latches lock the top in place. A transparent entry flap allows felines easy access while keeping odors inside. The Zeolite filter absorbs smells and freshens the air. This large cat pan is stain-resistant and very easy to clean. Lift it with the sturdy carrying handle to move the entire unit to another location. Van Ness Products Enclosed Cat Litter Pan, Large: Odor and stain-resistant Enclosed structure prevent cat litter spill. AN. This Van Ness Litter Pan is a good size that it can be placed in your bathroom or virtually anywhere you desire. Pets Cats Van Ness Cat Litter Boxes. We stand behind our products. Cat Litter Box Covered Pet Pan Liner Holder Locking Latches Plastic Large New This large enclosed cat pan controls odors and prevents cat litter spills. Designed from unbreakable high-impact plastic, it easily handles both the weight of your chosen litter and your cats. The enclosed cat pan features a bottom pan and a removable top. Four latches lock the top in place. A transparent entry flap allows felines easy access while keeping odors inside. The Zeolite filter absorbs smells and freshens the air. This large cat pan is stain-resistant and very easy to clean. Lift it with the sturdy carrying handle to move the entire unit to another location. Van Ness Covered Cat Litter Box, Large Pets Cats Van Ness Cat Litter BoxesThis large enclosed cat pan controls odors and prevents cat litter spills. Designed fro. It's made of sturdy, stain- and odor-resistant plastic. This large cat litter box is easy to use. It has four locking latches that connect the top and the bottom together. This litter box also features a removable door that lets your pet enter and exit easily while keeping odors inside. Item model number: CP5. This smartly designed unit features two nesting pans and a sifting screen. Stack the pans with the sifting screen on top and fill with clumping litter. Replace the sifting screen in the empty pan, move the litter from the full to the empty pan, restack, and your are finished. Designed from unbreakable high-impact plastic, it easily handles both the weight of your chosen litter and your cats. The enclosed cat pan features a bottom pan and a removable top. Four latches lock the top in place. Cat Litter Box Covered Large Sturdy Plastic Easy Clean Up Less odor Pet Pan NEW Van Ness Covered Cat Litter Box, Large Keep your home smelling fresh and clean with the Van Ness Products Covered Cat Litter Box. It's made of sturdy, stain- and odor-resistant plastic. This large cat litter box is easy to use. It has four locking latches that connect the top and the bottom together. This litter box also features a removable door that lets your pet enter and exit easily while keeping odors inside. It has a fully enclosed design that prevents litter from spilling over and onto your floors. The top features an odor-absorbing Zeolite filter to trap urine and feces smells to keep your indoor environment fresh. . Van Ness Products Enclosed Cat Litter Pan, Large: Odor and stain-resistant Enclosed structure p.